Theres always been a little Magic in her eyes| Cincinnati Ohio Unicorn Meet and Greet. 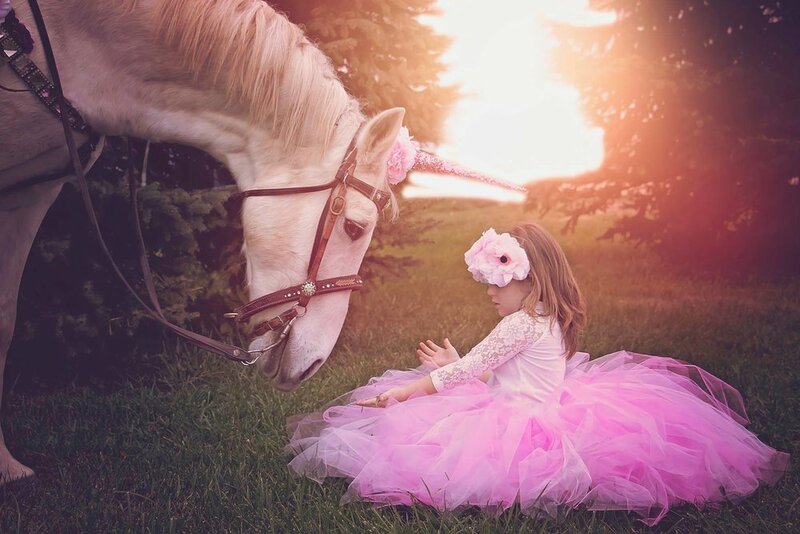 Every little girl dreams of meeting unicorn or something close to it at some point in their life. Some of us hold that dream close as we get older where others may let it go. Either way we all probably had the same dream. What If I told you that dream was *technically* achievable? Well it is! A while ago I had this amazing project pop up that I knew would be amazing If I could just find the correct pieces to the puzzle. Thanks to some great recommendations from some friends I found everything I needed for the session within a couple of days and set a date to make the magic happen. On the day of the session the weather gods were not playing so nice. I thought I'd have to cancel the session due to rain but I did a little rain go away for at least 2 hours and you can come back dance and it surprisingly worked! - You have to get creative withe the going gets ruff haha. We all helped get the horse saddled up, brushed and ready to be a unicorn. Getting the horn attached was probably the hardest part doing it in a way where it would stay when the horse would move AND not hurt him while doing so. After a couple of failed attempts we finally got it on and headed out to make some photo magic! When the session was over, Smokey, had had enough of his horn and smacked me with it when I was taking a selfie with him ( you only get so many opportunities to take a selfie with a "Unicorn"). I may have deserved that for turning a boy horse into a unicorn with a pink horn but I want to give a HUGE Thank you to Smokey and his person for allowing us to create some magic. If you're interested, here is a time lapse of one of the edits from this series!